Portable high-frequency devices that you can use at home are a great way to help you get a brighter, more radiant complexion. High-frequency treatments have been used for years at spas for a variety of different types of skin conditions. It is a particularly useful treatment for reducing the appearance of fine lines and wrinkles, and to prevent and treat acne. Luckily it isn’t necessary to go to a spa to get the benefits of this natural and safe treatment since there are many great at-home machines available. In this post we explore what you should know before buying a high-frequency device for home use, we also list some of the most popular and best quality products for you to consider. High-frequency treatments can provide many different benefits for your skin. The three most well-known benefits to HF treatments are that they can help get rid of acne-causing bacteria, help improve the look of aging skin, and can minimize enlarged pores and blackheads. Most of the benefits of using HF directly relate to the look of your skin. Because these types of treatments increase blood circulation to your face, they can be hugely beneficial to the overall healthy look of your skin. Some users find that it works well to reduce eye puffiness and dark circles. If you have a machine that has a comb attachment you can also use to improve hair growth and help prevent hair loss. Compared to other beauty treatments like laser or injections, it is non-invasive, it doesn’t hurt and won’t leave you with burns or irritated skin. The basic idea of these types of HF products is that they deliver alternating electric currents to the skin through (most commonly) a glass electrode. The electrode can come in a variety of shapes and sizes so you can treat different areas. When the electrode comes into contact with the skin thermal and electrical energy is passed to the skin. The energy creates oxidized Oxygen (Ozone) that generates all kinds of benefits for the skin including killing bacteria and stimulating collagen and the cells. The New Spa d’Arsonval Professional Grade Device is one of the most popular ‘Professional Grade’ options available. Its popularity stems from the quality you are getting for the price and the large number of attachments that it has. This machine works very well if you have acne, many users report that can get rid of blemishes within a few days of use due to the formation of ozone that kills acne-causing bacteria. It is also great at removing warts, cold sores and can help with the appearance of fine lines by making the skin appear firmer. It has a high frequency alternating current 200,000 cycles per second that can increase circulation, help to remove waste and provide deeper product penetration. This product from New Spa comes with ten attachments; 7 of the accessories are Argon electrodes including roller, comb, bar, rod, spoon, mushroom, and the t-electrode. You also get three neon electrode attachments of rod, spoon, and mushroom. 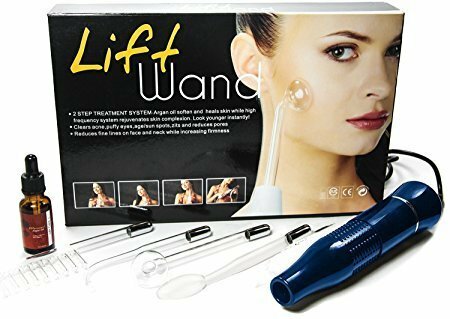 The Lift Wand is another excellent option if you are looking for an easy to use, reasonably priced device that works well for anti-aging. The Lift Wand comes with four electrode attachments, as well as a bottle of Natural Argan oil. 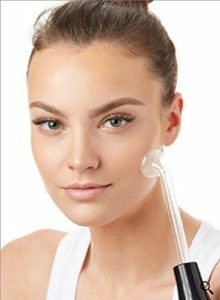 The electrode attachments include a face electrode to increase elasticity and collagen production, a nose electrode to minimize pores and control oil production, and an ear electrode for behind the ear lobes. It also comes with a comb attachment that you can use to help stimulate hair growth or for other skin issues that may be affecting the scalp. An instructional DVD is included in this package, which can be very helpful if you are confused about how best to use this type of machine at home. It is a fantastic treatment for anti-aging, due to the power of the product and the fact that you use it in combination with the argon oil. 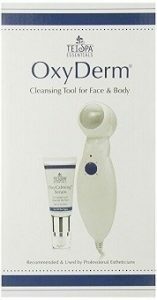 If you are looking for a device to help with acne-prone skin, the OxyDerm Professional Beauty Device is worth a look. It has been specifically designed to help purify and sterilize the surface, and to fight against inflammation. Not only can the OxyDerm help with blemishes, but it can also help brighten skin tone and help reduce the look of fine lines. The OxyDerm works in the same way as the other HF products that produce ozone and create a sterilizing effect by killing off the acne-causing bacteria. The high-frequency waves also help to stimulate the circulation of the skin, which adds to the overall healthy look of your face. 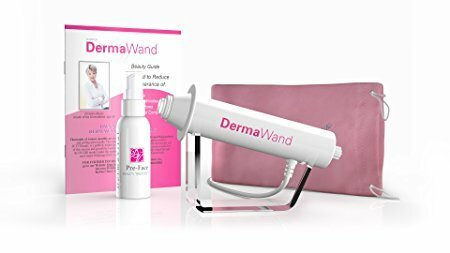 The Dermawand has been around for some years now and is quite popular as an easy to use, convenient, high-frequency device. It doesn’t have a very high power setting or use the glass probes that the New Spa device or the Lift Wand have, but it is a handy little unit that works well for getting rid of acne and helping to reduce the look of fine lines. In the 1970s European spas began to use the high-frequency current to treat acne and fine lines. It soon made its way over to North America and is now commonly used in most spas to help with a variety of skin conditions. Skin care professionals love high frequency because it is a safe and non-invasive treatment that has few side effects. The number of attachments– Depending on what you are trying to achieve using an HF device you may want to pay close attention to the type of accessories that come with the product (if any). If you are new to HF treatments, you may want to start with a product with 3 or 4 attachments like the Lift Wand. If you find that you want to try more accessories, then you can upgrade to the New Spa Professional Device that comes with ten electrodes. Mushroom – Used on the cheeks, forehead, neck, and chest. It is the most popular attachment for these types of machines. Point- Used for blemishes, eye area, small points. Portable– If you travel a lot, you may want to consider how portable the machine will be. If you are using it a few times a week, you may not want to stop treatment if you go away. You probably won’t take the products that have the glass electrodes on a trip, as they may break easily. A Dermawand or the Oxyderm device are a little more portable than some of the other options. Grounding Plug-It is crucial that any high-frequency facial machine operating at over 5 watts offers a three-pronged power supply plug. You need to have a three-pronged plug to prevent any damage to the device and to prevent the risk of shock. Not all of the machines offer this, and it is a pretty important safety feature. Power – The power level of an HF machine is measured by the high-frequency oscillation rate (measured in Hertz). It is somewhat confusing because some manufacturers measure the power by the level of wattage. Most experts recommend choosing a device with a wattage that is less than ten but with a high rate of oscillation of 100,000 or more Hertz (cycles per second). Argon or Neon– The devices that come with the glass electrode attachments have either neon (orange) or argon (violet) electrodes. Neon is generally used by professional spas for anti-aging treatments on the skin due to its stimulating effect, while argon is often considered best for treating acne because of its anti-bacterial qualities. If used correctly, there are very few side effects from this type of treatment. Some users have a slightly red face after a procedure that usually fades within an hour or so. If the skin goes a bit red that is a sign that the circulation is being activated. Some users have reported hair growth on their face after doing treatments for long periods. It is an uncommon side effect, but it does happen. High-frequency machines are generally considered safe for at home use as long as they are used correctly. It is critical that you read all instructions and warnings that come with any product that you purchase. You should also follow all the recommendations. You have a pacemaker or a history of heart disease. If you are wearing metal jewelry. If the bulb is broken or damaged. If you have any other health conditions that you are unsure may be affected by the HF treatment consult your doctor. How often should you use a high-frequency machine? The length and number of treatments vary from machine to machine, so refer to each machines treatment plan before purchasing or starting treatment. The New Spa High-Frequency d’Arsonval Professional Grade Device with Argon Electrodes recommends using it for 7-10 minutes every other day for 8-16 consecutive treatments. The Lift Wand can be used for 15 minutes a day every day. The OxyDerm recommends different treatment times based on your skin type (oily/dry/combo). The Dermawand recommends that you do two, three-minute treatments a day. No matter how often you use it, it is generally recommended that you combine the treatment with nourishing skin cream or serum after using the device. You should also ensure that you do not overuse any of the at-home devices. Using a tool more than is recommended won’t give you better results and may result in damaging the coil within the machine. High-frequency treatments are much less painful and invasive than a lot of professional treatments that are available. When doing a treatment with an at-home device, you may experience a mild warming sensation, along with a tingling or minor stinging. Some tools will make a low zapping type of sound, which may alarm some users but that is just the electricity that is what creates the benefits. Many of these at home devices are somewhat pricey, so it is worth ensuring you are following the proper care and maintenance for any at home product that you purchase. Not only will they last longer and work better, but they will also be safer to use. Make sure you are doing the treatment on a clean, dry face or a face that has only recommended products on it. Your face also shouldn’t have any toner or product that contains alcohol, as they can be flammable. You should also avoid acid based products like Retin-A or L- ascorbic acids. Some acids could damage the electrode tip or may irritate your skin. To clean your device use a cotton pad and wash it with a soap and water solution. Do not use any cleaner that contains alcohol or acetone. Also never submerge any detachable electrodes in water, you can, however, place the tip/end into a soap and water solution. Dry with a clean towel. High-frequency home machines can be a beneficial addition to your home beauty routine. If used correctly and safely, you may find that you will get tight, glowing skin with less fine lines and wrinkles. If you have acne, you may find the germicidal effect of HF products hugely helpful along with your other treatment options. You will need to use the devices for extended periods to get the best results. Also be aware that results vary quite a bit based on what types of skin conditions you are treating, your age and genetic makeup, and any previous damage to the skin.